Ray White Commercial (WA) is pleased to exclusively present for sale Lot 1, 110 Mounts Bay Road, Perth. The property is located in Mounts Bay Village, a mixed residential/commercial development of almost 500 strata units across 9 buildings consisting of short-term and long-term apartments, offices and a restaurant. Close to the Perth Convention Centre, CBD and foot of Kings Park the properties represent an excellent location for a stable investment for years to come. 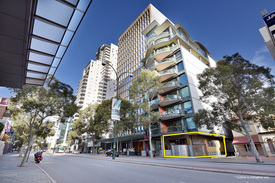 - Lot 1/110 Mounts Bay Road comprises of a 92sqm* conference room and kitchen. LEASED TO NATIONAL CORPOR.. Price: $1,750,000 As a Going Con..
Prime CBD Investment - 6 .. Price: $1,390,000 (GST as a goin..
CBD Leased Investment 6.2.. Price: $1,455,000 (G.S.T. Going ..